Preview of e-learning chronic pain care module, "Edna"
An online training module designed for the evaluation and care of chronic pain greatly improved medical student clinical skills, according to a report in the Journal of the American Geriatrics Society. 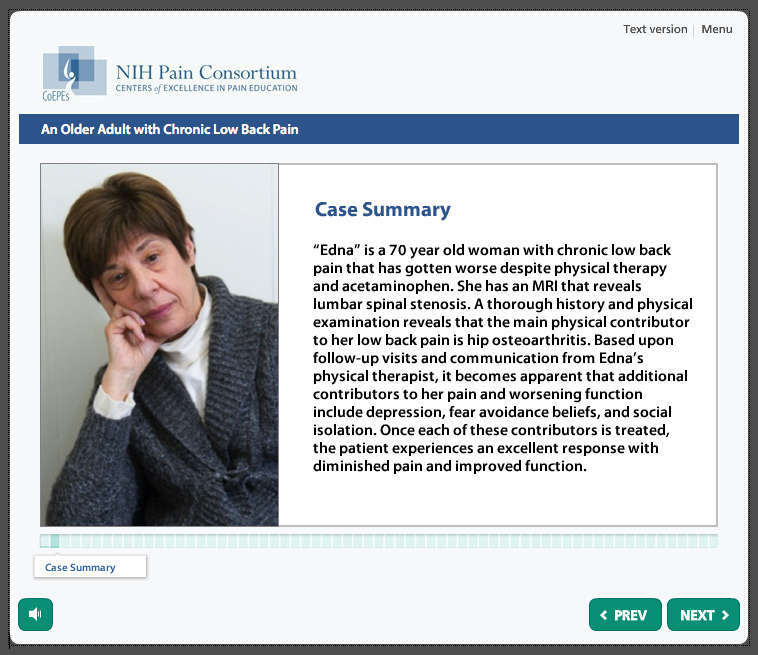 The module, built by the University of Pittsburgh and using an elderly woman with chronic lower back pain as a case study, is the first curriculum resource created through the efforts of the National Institutes of Health Pain Consortium’s Centers of Excellence in Pain Education program (CoEPEs). The program was developed in response to the Affordable Care Act’s mandate to advance the science, research, care and education of pain. The CoEPEs were selected in 2012 to act as hubs for the development, evaluation, and distribution of pain management curriculum resources for medical, dental, nursing, and pharmacy schools. The NIH Pain Consortium developed the centers to improve how health care professionals are taught about pain and its treatment. The module is the first to be completed and evaluated for effectiveness. A team of six experts in education, information technology, pain management, and geriatrics at the University of Pittsburgh developed the module, focusing on common errors in clinical exams, expert modeling, interactivity, and feedback. The module presented a standardized case of an elderly back pain patient called Edna, with brief video clips that showed her interacting with her clinician. The module also contains a multiple choice pre-test, interactive questions, and a multiple choice post-test. Twenty-seven medical students were exposed to the module and 28 were not. The students in the group exposed to the module did significantly better on their objective structured clinical examinations, an exam during which medical students rotate through multiple stations, each with an objective examiner, demonstrating clinical skills and knowledge while interviewing real or simulated patients. Ninety-three percent of the students in the exposed group passed the exam, compared to 60 percent of the non-exposed group. To view the paper (published May 15), go to http://onlinelibrary.wiley.com/doi/10.1111/jgs.12871/abstract. The CoEPEs are creating and testing online, case-based pain education modules for use in their own teaching institutions. Edna and several other modules will be made available to other teaching institutions beginning in the fall of 2014 at https://www.painconsortium.nih.gov/Funding_Research/CoEPEs. These modules are also accessible by the general public to help them learn how to discuss chronic pain with their doctors. Chronic pain affects approximately 100 million Americans, costing up to $635 billion in medical treatment and lost productivity and contributing to poor quality of life. Yet, pain treatment is not taught extensively in many health professional schools. The curriculum resources developed by the CoEPEs aim to advance the assessment and safe treatment of multiple pain conditions for diverse population groups, while minimizing the abuse of opioid pain relievers. The curriculum resources developed by this program will teach about the various types of chronic pain, medications to treat specific pain conditions, and factors that contribute to both under- and over-prescribing of pain medications. The courses will include the latest research in complementary and integrative pain management. The news release announcing the selection of the specific CoEPEs can be found here: https://www.painconsortium.nih.gov/Funding_Research/CoEPEs. The sponsors of this Pain Consortium initiative are NIDA: Lead; Eunice Kennedy Shriver National Institute of Child Health and Human Development (NICHD), National Center for Complementary and Alternative Medicine (NCCAM), National Institute of Dental and Craniofacial Research (NIDCR), National Institute of Nursing Research (NINR), National Institute of Arthritis and Musculoskeletal and Skin Diseases (NIAMS), National Institute of Neurological Disorders and Stroke (NINDS), National Institute on Aging (NIA), Office of Behavioral and Social Sciences Research (OBSSR), and the Office of Research on Women’s Health (ORWH). NIH supports the full spectrum of pain research from basic understanding of pain mechanisms through translation of discoveries into treatments and prevention strategies. In FY 2013, NIH supported an estimated $400 million in research focused on chronic pain, not including the related diseases that often cause chronic pain, such as cancer, arthritis, diabetes, and stroke. The details of individual pain-focused grants are publicly available on the NIH RePORTER website. Enhancing education of pain care professionals was highlighted in the June 2011 Institute of Medicine report “Relieving Pain in America: A Blueprint for Transforming Prevention, Care, Education, and Research,” a report mandated by the 2010 Patient Protection and Affordable Care Act. NIDA. "﻿NIH Pain Consortium’s first pain care curriculum improves clinical skills." National Institute on Drug Abuse, 21 May. 2014, https://www.drugabuse.gov/news-events/news-releases/2014/05/nih-pain-consortiums-first-pain-care-curriculum-improves-clinical-skills. NIDA. ﻿NIH Pain Consortium’s first pain care curriculum improves clinical skills. National Institute on Drug Abuse website. https://www.drugabuse.gov/news-events/news-releases/2014/05/nih-pain-consortiums-first-pain-care-curriculum-improves-clinical-skills. May 21, 2014.